With the recent release of Windows 10, there has also been a side issue that has impacted CIMCO Software licensees. 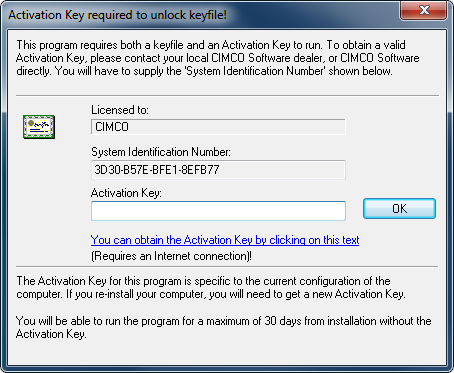 The upgrade to Windows 10 is causing your CIMCO products to require re-activation. If you are considering an upgrade, follow the steps in this article to prepare in advance to avoid any down-time from the license re-activation process. If you have already upgraded to Windows 10 and can no longer access your CIMCO product, this procedure still applies. The first step is to contact your CIMCO dealer and advise them that you have or will be upgrading to Windows 10 and need to re-activate your license file. It is helpful if you are on the computer with the CIMCO software at the time of the call. Your dealer should be able to look up your license and add the necessary activation(s) to your products in the order system. At that point, the text link in the activation screen will work and you will be able to obtain a new activation code. This is not really a CIMCO issue, it has to do with how Windows 10 alters your system configuration. CIMCO flags this as if the product had been moved to a new computer, resulting in the re-activation necessity. Did this help you resolve the issue? If not you can contact us for assistance.